Race and ethnicity questions, which are required to be filled out on the census, were improperly completed by some Census workers. (CNN) -- For the past eight weeks, census workers have been knocking on doors and ringing bells all across America -- but in some cases, they've been nixing questions about race and ethnicity, says a new government report. According to a recent report by the U.S. Commerce Department Office of the Inspector General, 71 out of 480 observed census workers failed to follow procedures when conducting face-to-face census gathering. The Census Bureau hired more than 600,000 temporary employees to visit homes and conduct in-person interviews of individuals who did not mail their census forms. Upon their visits, census workers are supposed to read aloud the 10 census questions, including those on race and ethnicity. Yet, according to the report, 71 workers incorrectly communicated the race and Hispanic-origin question to respondents. 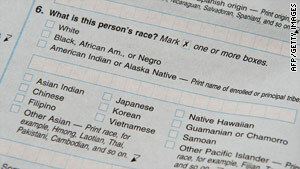 Some census workers made assumptions about individuals' race and filled in boxes without asking the respondent the ethnic background questions, while others failed to ask their respondents if they wanted the questions read aloud. OIG staff members observed door-to-door census interviews between April 23 and May 14. The Census Bureau said that although these actions occurred they are not reflective of the follow-up process as a whole. "The OIG only observed 480 interviews out of the 48 million households we have to visit in our door-to-door operations," said the Census Bureau's Michael C. Cook, adding that the bureau has completed 93 percent of its in-person follow-up interviews. In response to questions about misrepresentation of numbers by race and ethnicity on the census, Cook said that "each situation is a case by case analysis" and that the bureau would "take corrective actions where appropriate." Yet, Stephen Robert Morse, executive editor and founder of MyTwoCensus.com, a non-partisan watchdog of the census, claimed that the mishandling of census questions is one of many issues that need to be addressed. "This situation is bad for Americans, especially as our society becomes more multiracial and diverse," he said. "The goal is to create a head count by collecting basic information in order to support the distribution of funding for the nation. Assumptions about race on a form may seem minute, but at the end of the day these small slip-ups will hinder communities in the future." The training process for census workers was also critiqued by the OIG in a May 2010 memo of the Quarterly Report to Congress, which was sent to Robert Graves, director of the U.S. Census Bureau. The census utilizes a "verbatim training methodology" that requires trainees to read word for word from a manual to conduct census operations, according to the memo. "This 'one-size-fits-all' approach does not provide employees with the necessary information to accomplish their jobs, and may have contributed to some of the inconsistent enumeration practices we observed in several operations," it said. The report recommended the Census Bureau "reiterate the enumeration procedures" to census workers and "the importance of ensuring that the respondent understands the race and Hispanic-origin questions." The Census Bureau issued reminders to their regional offices to implement the same verbatim procedure the OIG had previously criticized. Morse doesn't believe the bureau will change overnight. He expressed his concern over the census workers' misjudgment on assuming race. "All because someone might look a certain way doesn't mean that reflects their background or how they identify themselves," he said. "If census workers continue to lump together people of color into one box, they are just going to get a dog pile of incorrect information." The Census Bureau plans to finish the door-to-door census ahead of schedule on the first week of July.